White At A Wedding? Let Your Fav Celebs Inspire Your Look! The pristine color, the subtle textures and the simplicity of white. These celebs show us how to rock this no-color in Indian wear like never before. The beauty of white is evergreen and it looks so gorgeous with a tint of color or some silver and gold accents. Take cue and dress like the superstars! 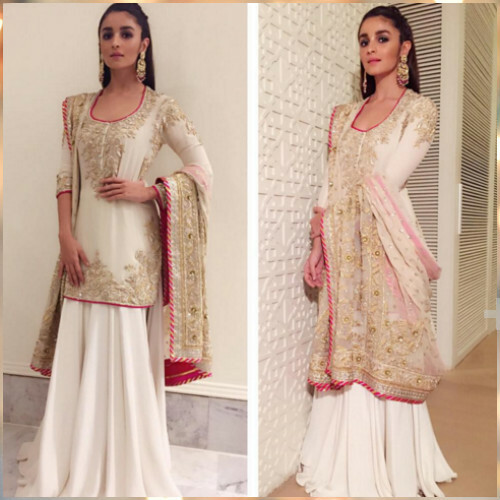 Image Source: Stylist Ami Patel On Instagram Alia Bhatt shows us how to carry off this trend so effortlessly. A kurti on top of a plain white skirt or a sharara with those gorgeous earrings and a simple hair style. We’d love to copy this! Athiya Shetty looks fabulous in this traditional skirt and contemporary blouse. The hint of colored embroidery lends a beautiful dimension to this white ensemble! Image Source: Karisma Kapoor On Instagram Karisma knows exactly how to wear white like a superstar. Add that full sleeve blouse to that embroidered saree and that lovely hairdo - she does give us some solid saree inspiration! Image Source: Deepika Padukone on Instagram Deepika looks as stunning as ever in this easy going kurta with an open front and a skirt inside. The gathers around the waist give it such a perfect shape. We are loving this style! Image Source: Shilpa Shetty on Instagram This goddess loves to experiment with Indian wear styles. Here, she creates some magic with this draped beauty. She sure knows how to show off that perfectly toned body well! 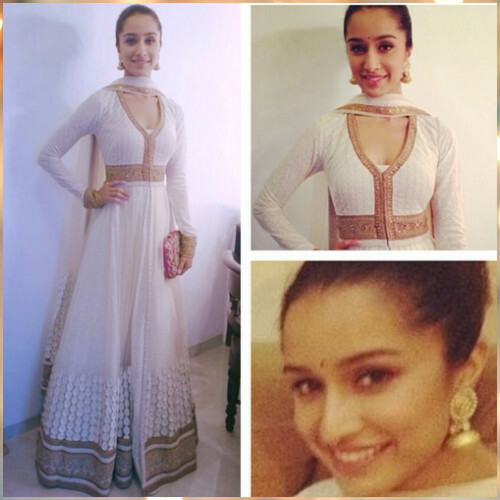 Image Source: Shraddha Kapoor on Instagram Shraddha looks so graceful in this floor length anarkali. If you want to keep it simple then this is a style we love! Those gold jhumkis complete the look seamlessly. 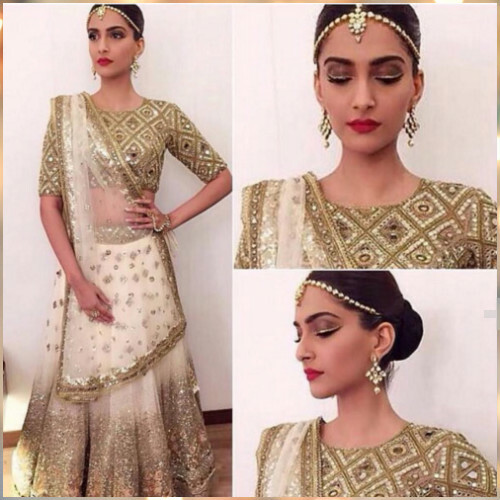 Image Source: Sonam Kapoor On Instagram Sonam glitters in this gold and white outfit. Tiny sequins sprinkled all over the dupatta and the heavy blouse makes this one a total winner! Definitely something we’d want to try! From the net fabric saree to the simple white embroidery and that adorable blouse, Kangana stole our hearts with this elegant saree that she wore to Masaba’s wedding! Image Source: Karisma Kapoor On Instagram This modern twist on ethnic wear is making us go WOW! This jumpsuit with those tiny cut outs at the stomach are so delightfully different! We love the pop of orange at the ears! 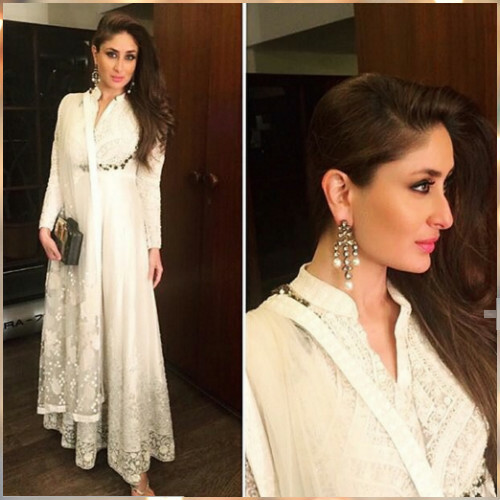 Image Source: Kareena Kapoor On Instagram Kareena carries this suit so amazingly. The chikankari embroidery with those pearl earrings spell out elegance and sophistication! 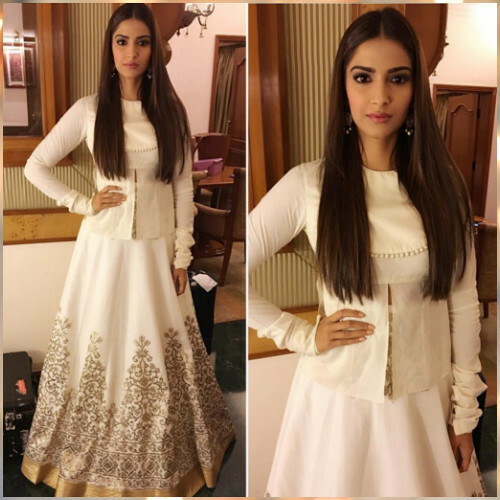 Image Source: Namrata Soni on Instagram Our fav fashion diva teaches us a thing or two about wearing white, without a doubt! She teams this sweet golden and white skirt with a sleek hairstyle and pretty earrings! 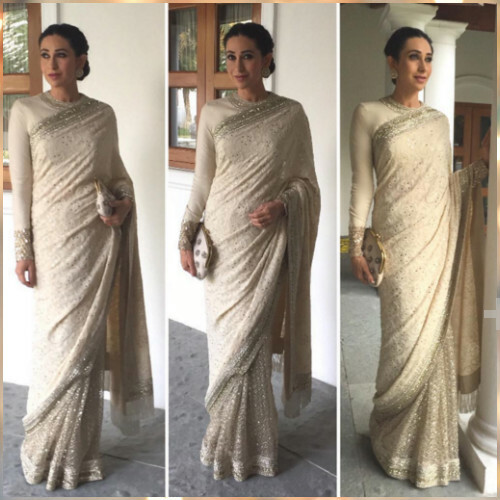 Image Source: Karisma Kapoor On Instagram Want to wear something that is outstanding? 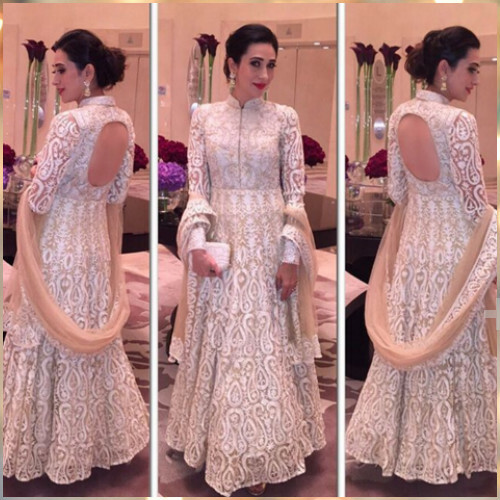 Karisma shows us how to carry off this beautifully intricate anarkali in a suave manner! Images: Viral Bhayani HAVE A STORY IDEA FOR POPxo? If you want to hear about it, we can write about it! Just tell us your idea here! 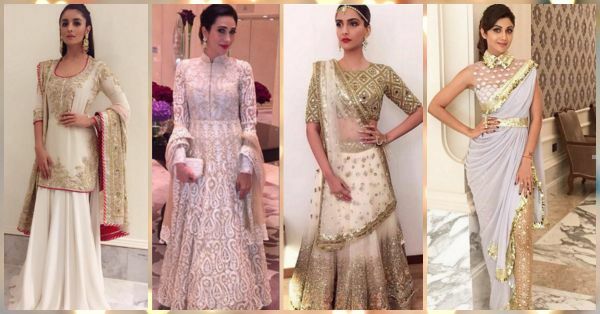 MUST-READ: How To Look Super Elegant At A Wedding – For Rs 2,000 Or Less! MUST-READ: Not Just Lehengas! 7 Gorgeous Ghararas For Your Wedding!